Discussion in 'Houston Astros' started by jim1961, Feb 18, 2018. Ive listed the first three above. If anyone gets any word these games can be seen, please share. Preseason? What, is this basketball/football? [Spring Training Game Thread] That's what Castor used last year. FLASH21 and mick fry like this. 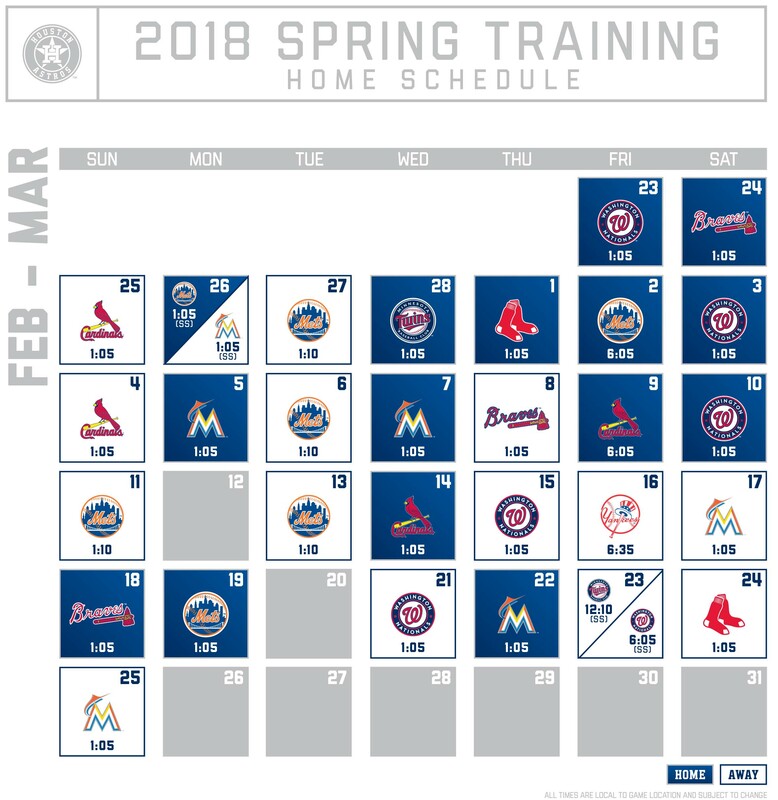 If you go to the astros.com schedule page and change it to list view, its easier to see the broadcast options. Regardless, I am really stoked to watch them play again. Cant wait till Friday. Joe Joe and texans1095 like this. Looking forward to Spring Training games starting. I expect I'll be sick of Spring Training by Friday next week. Agreed. Competition is essentially who is LHRP, will Fisher start in LF, and will Reed or White or someone else win the opening week Gurriel sweepstakes. I suspect Marwin will start there opening day. I'd add in Stassi's performance, although he's not necessarily competing against anyone other than himself. It sounds like they are going to carry three catchers on the active roster with Gattis playing more regularly at DH. But that could change if Stassi flops in spring training. Right now, I just want to see how guys look. Position battles wont get a deep look until late May at the earliest probably. Still, I just miss seeing them, even when the games dont count. Does anyone know if away feeds are blacked out over MLB.TV for a local game? I'm thinking about signing up for MLB.TV this year to watch my Stros but cut my cable recently. What is the best way to see all the games online? Can't speak for Spring Training games but for the regular season just go to reddit mlb streams (/r/MLBStreams!) and you'll generally find every game HD quality with no lag assuming you have good internet speed. reddit mlb streams are the way to go. The same quality as mlb.tv streams and 100% free. I had missed that AJ Hinch penmanship. Last season, MLB was pretty good about putting the spring training games on the MLB youtube channel. Often they were posted within 24 hours.